This particular nettle pasta is called strettine. It is a springtime favorite in Emilia Romagna, which is north of Rome and lies in the agricultural heartland of the peninsula; this is where you get that amazing parmigiano cheese and bolognese sauce we all love. Strettine is a flat, narrow pasta enriched with eggs and chopped nettles — young nettles are loaded with vitamins and act as a spring tonic after eating so much heavy food all winter. Spinach is a good substitute. It is important to chop the cooked nettles very well or you will get streaky bits in the noodles. Or better yet, mix the chopped nettles with a little water and puree in a blender or food processor. Strettine dry pretty well, so you can make them a day ahead — don’t try to store for too long, though. Eat within a few days. What to serve your nettle pasta with? Make enough to do two meals: First with just good fresh butter and parmigiano cheese, and then with a sugo or ragu of “white meats,” meaning chicken, pheasant, rabbit, quail, turkey, etc. The best ragu recipe I can think of is one with rabbit or chicken I call Winter Into Spring. 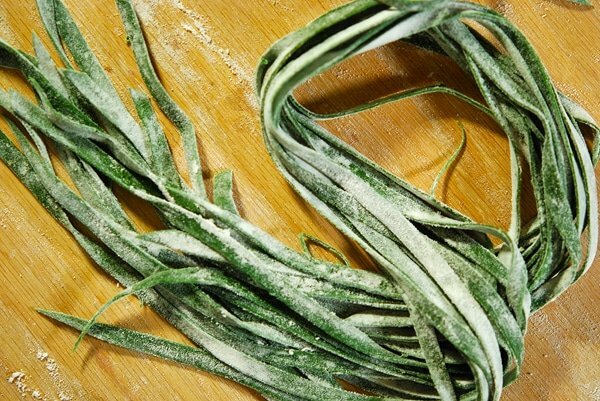 This pasta recipe is designed for fresh or thawed nettles, but dried nettle powder also works. You'll need to adjust the water content of the recipe, however. You'll see I use no egg here. The reason is because it alters the color, and not in a good way. Depending on how old your nettles are, you will need two or three big tong-fulls of fresh nettles to get your 4 ounces. I say tong-fulls because you do not want to pick up fresh nettles, as they will sting you. Thus the name. Get a huge pot of water boiling and add a handful of salt. Grab the nettles with tongs and put them into the boiling water. Stir around and boil for 1 to 3 minutes, depending on how old they are. Fish them out with a skimmer or the tongs and immediately dump them into a big bowl with ice water in it. Once they are cool, put them in a colander to strain. Remove any thick stems. Chop the nettles roughly. Puree the nettles with a little water in a blender. When you are done, add a little water into the bowl of the blender to help clean it out, but save the water -- you might need this "nettle water" if your dough is not moist enough. Put the flour in a large bowl and make a well in the center. 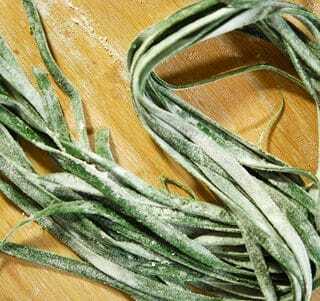 Add the nettle puree and gradually incorporate it into the flour until you get a shaggy mass. If it's too stiff add a little of the nettle water. Start folding the dough over itself until it comes together, then begin kneading. This is a medium strength dough, so you’ll need to knead for 5 to 8 minutes. Cover the dough with a thin film of olive oil and wrap in plastic. Let it sit for an hour. Cut off a piece of the dough and roll it out in a pasta machine. How thick? Your choice. But the traditional width for strettine is relatively thick, about a little less than 1/8 inch. This corresponds to No. 5 on my machine, which is an Atlas. Once you have your sheet of pasta, you can cut it with the wide tines on your pasta cutter. That’s easy, but the real noodles are a little narrower. 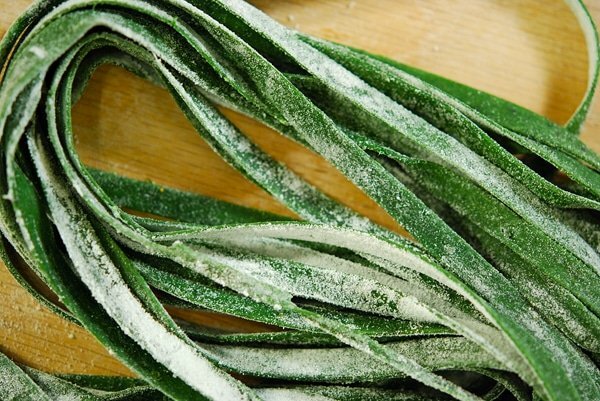 To hand cut your noodles, make sure the sheet is supple and cool, not sticky. If it is sticky, dust with a little flour and smooth it over the surface with your hand. Loosely roll the dough sheet up so that the slices you are about to make form long pasta. Using a sharp (it must be sharp, or you will be in trouble!) chef’s knife, cleaver or other large blade, slice the loose roll at intervals somewhere between 1/8 and 1/4 inches. Lay the pasta on the counter or board with some flour dusted on them. Repeat with the rest of the dough. After every little batch, pick up the previous one that had been drying and give it a slight twist, making it into a loose nest. This makes for easier storage. The strettine will sit like this for up to a day. Boil in lots of salty water until they float, and then for another minute or two. 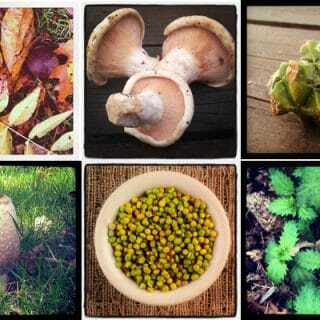 You can find all sorts of recipes for wild edible plants here on Hunter Angler Gardener Cook. Here is the recipe for Nettle Khachapuri. oil the surface and cover and let rest for several hours. Roll out the dough to about twice the size of your baking tray. If you roll it out on baking paper you can manipulate it more easily after. Cover half the surface with shredded feta (about 400g- a bit less than a pound) and mozzarella (about 400-500g – a bit less than a pound), leaving about a 3 cm (a bit more than 1 inch) border. Cover this with a generous layer of washed and drained nettle leaves. I chop them up in the colander a bit with a pair of scissors). Wear gloves when handling. I also add other greens that are around – garlic mustard, ramps, dandelion greens, hogweed (you would probably call it cow parsnip in North America) … whatever… but it is good with just nettle. Flap the other half of the dough over to cover. Press the edge together and roll it up a bit to seal. Cut holes in the top with the scissors or a knife to let the steam from the nettles escape during baking. Slide this onto your baking tray and bake at 180°C (350°F) for about 30 minutes.